Very nice fall weather continues today and Veteran's Day with highs near 70° and plenty of sunshine. A weak cold front moves through Friday night and helps to reinforce the cooler and drier air. Saturday's temperatures start in the mid 40s and only climb to about 62° with a northeast breeze. 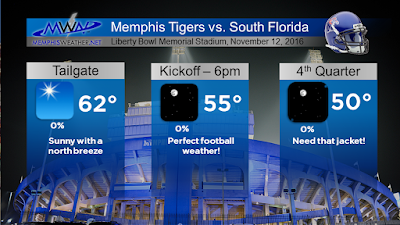 If you're going to the Memphis Tigers football game Saturday evening, you'll want to prepare for cool temperatures with a kickoff temperature in the mid 50s, falling to near 50° during the game. A bit of rain on Tuesday barely put a dent in the ongoing drought conditions. The map below shows the percentage of normal precipitation over the past 60 days. 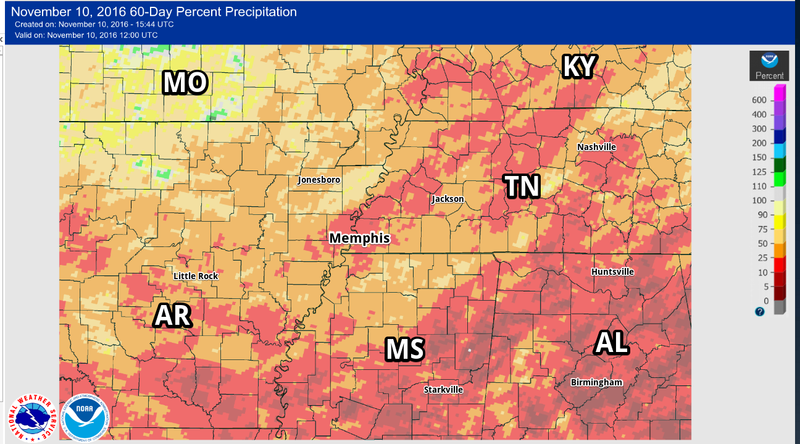 The Memphis area is near 25% of normal. Areas to our southeast are even worse. In fact, today Birmingham set an all-time "no rain" record. It's been 53 days since their last measurable rainfall! 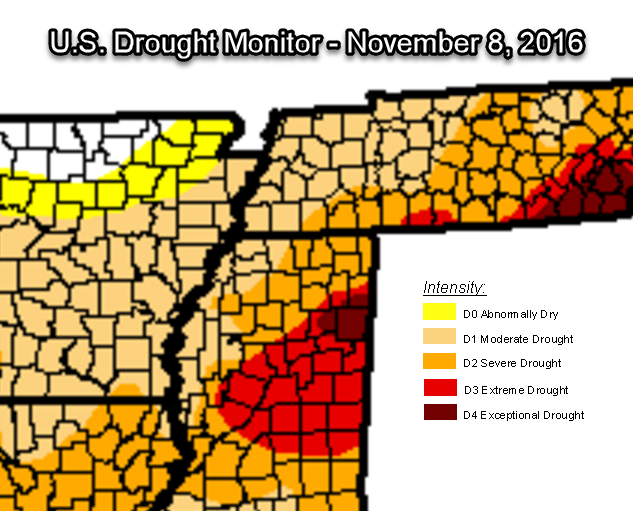 The current drought conditions for the Mid-South are shown below. The drought intensity in the metro is unchanged for the past few weeks, continuing in "moderate drought" conditions. The lack of rainfall and recent warm weather will likely have a muting effect on (and delay) the fall colors in the trees. Burn bans continue in MS with some firer restrictions in west TN. Looking ahead, the long-range forecast through Thanksgiving shows pleasant temperatures that remain above normal through much of the next week, followed by a fairly significant frontal system late next week that should cool us down again heading into Thanksiving week. (Average highs this time of year are in the mid 60s and lows in the mid 40s. By Thanksgiving, we should be seeing highs near 60°.) 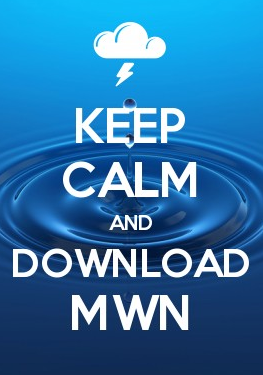 The official MWN Forecast can be found anytime in our mobile apps or on our website. Frost is a little more tricky as temperatures, wind, and moisture all play into whether frost forms. A breezy morning with a low of 33° won't produce frost, but a low-lying area with no wind and clear sky could see frost in the upper 30s. The National Weather Service uses 36° as a proxy for "first frost," which is reasonable. 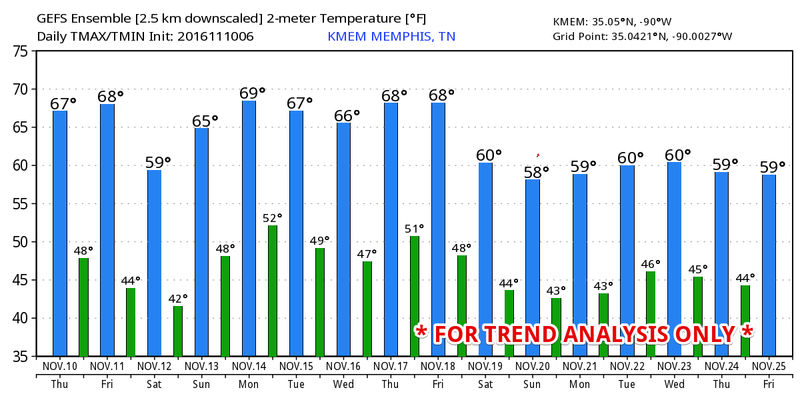 The average first frost at Memphis International is November 2, while at the Agricenter it is October 25. More frost, freeze and snow records can be found on MemphisWeather.net. Finally, a word of thanks to all of those who have served this country in the armed forces, whether in peace time or war, and those who continue to serve. We appreciate your sacrifices and those that your families make on a daily basis and will support you in whatever way we are able! In fact, be sure you're following us on Facebook or Twitter (links below) as we'll be giving away free MWN apps to our friends that are active duty or retired service members, as well as first responders, on Friday as a small token of our appreciation! Thank you and God bless! 80s to 30s - welcome to fall in Memphis! It's a bird! It's a plane! No, it's Supermoon!